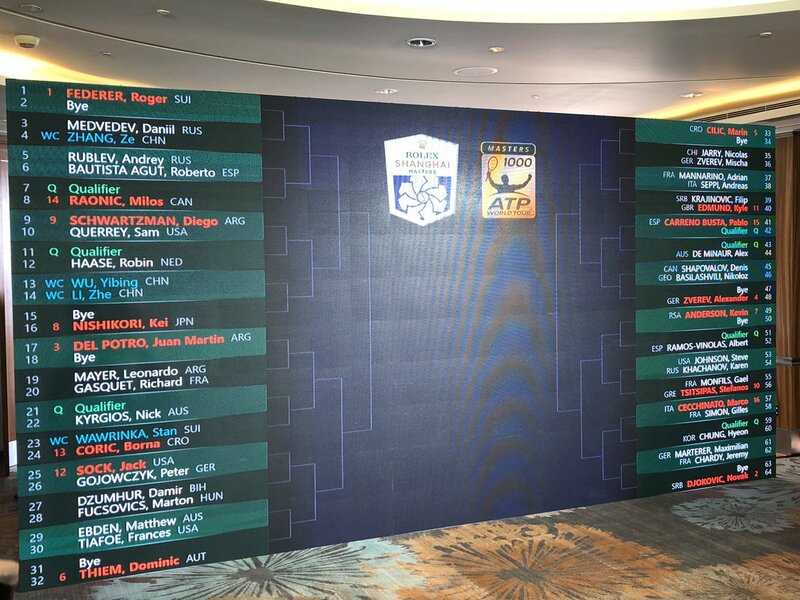 The 2018 Shanghai Rolex Masters Draw took place at 10.30 am local time with Dominic Thiem, Gilles Simon and Di Wu present at the Kunlun Jing An hotel for the draw ceremony. After the customary bye, it looks like Roger's first opponent could be Daniil Medvedev. The bad news for Roger is the Russian has been in solid form of late, playing well in St. Petersberg and following it up nicely at the Rakuten Open in Japan. The good news is he's got a final to play tomorrow in Tokyo and he will have played 7 matches in 7 days to get there having gone through qualifying so he's likely pretty tired. Should they meet Medvedev is a tricky opponent, he's quick, has flat shots and Roger has never played him before so it should be interesting. There's always a chance you can get caught cold coming in without too much prep but I'd go with Fed and at least he got a run out at the Laver Cup which should help. He's practised a couple of times in Shanghai already too so the conditions aren't totally alien. The third round has Raonic as the seeded player but he will have to face Agut or Rublev in the second round which isn't a given. However, although Agut has played well in Shanghai before I'm not sure about his form of late as he's had a few injuries stemming back to Halle and then Cincinnati. Rublev isn't in good form either so I think the Raobot is the favourite to come through. Raonic's serve gives him a chance in virtually any match he plays but he doesn't seem like the player of a few seasons ago so you'd have to make Roger the favourite with his H2H record and ability to neutralise big servers as we saw against Isner in Chicago. The Quarter's don't get any easier with Nishikori as the top seed. He's playing Medvedev in tomorrow's Tokyo Open final and he's looked in impressive form having not dropped a set there. When Kei's on he's awesome to watch with compact strokes, quick feet and hands and he can take it super early. That can obviously cause Roger problems but the Swiss has won the last four meetings and if he can get after Kei's serve it's tough to see the Japanese being able to build pressure on the return. The semifinals then has Del Potro as the top seed. After withdrawing from the Laver Cup he's made a comeback in Beijing and is in tomorrow's final. Looks like he's bidding to try end the year at Number 1 with that move. The Argentine has only managed to play in Shanghai four times in his career but he's made the final and semi-final before so has to fancy his chances of a deep run. Kyrgios, Stan, Coric and Thiem are all in his Quarter with the Austrian finding some hard court form winning St Petersberg last weekend. I'll pick Del Potro to come through even though he's not usually a back to back tournament man. As for the final with no Nadal in the draw, Djokovic is the number 2 seed and it will be interesting to see how he goes after winning the US Open. He looked a bit tired at the Laver Cup but he's had a week off and practised after Roger in Shanghai today #lavercupftw. Cilic, Anderson and Zverev are also in that half but it's only Big Kev who's shown form of late. Anyway one match at a time and I'm guessing Fed plays Wednesday against Medvedev or wild card Ze Zhang. Tricky draw, Roger has to be super focus from his 1st match. Not easy path to final, praying for some luck with draw clearing up for him. Time to break the uniqlo curse. Cmon Rog!!! beaten him recently so awe will not be a factor.We shall see. Djoker 27-2 since Roland Garros, pretty impressive. Also that is a very nice picture of Fed and Djokovic. But please, Roger, I would appreciate not to crunch too many nails this time. He will have the fully devoted Chinese audience supporting him. Did you see those awesome pictures of his training session today ? I didn’t know “tifos” did exist in tennis ! Haha full house for a practice session. The thing I like most about the draw is seeing Fed’s name at the top twenty years after the start of his pro career. Oh yea, rightfully amazing. I hope he’s as relaxed and well pleased as in LC, then I won’t bite nails. Freshest players to do well here so counting on Fedole to come thru to contest match no 24554324 and Fed to get the win. He knows he has 1500 points to defend over next couple of weeks so has to start fast from the get go. Delpo has never played well back to back so not sure that will change. Novak might be caught cold by a Stef but all these players are tired too. Hopefully Fed will deliver, feel we need a title ……. Tough draw again for Roger, but we should get used to it by now. It has been a while since he won a title so it is about time. Very frustrating, just like waiting for your favorite batsman to get to his century and going through the nervous nineties. 98 has been there for too long. Let’s get 99 and 100 in the next two and get it over with. Hate to see Delpo in Roger’s corner every single time. Which of these two dream scenarios would you prefer, Ganesh ? then, 100 in Basel – his home town ? then, 100 in Melbourne in Jan. 2019 ? I’ll go for option #2. I think he’ll do alright. It seems he was feeling well in LC physically and mentally, and why not continue this. Actually he has nothing to miss except the possible fun in performing, and maybe, hopefully, that takes away unsuitable nerves, making room for the only important: having fun and good energy. It’s a new tournament: that was last year, this is this. Will it make a difference that he won it last year? Ah yee, champion defense may make a bit of a pressure, but… I mean, he has won SO much, now is time for enjoy (which he always does when he wins) his tennis, regardless…He did it in LC. And was pressed of course, but this he seemed to enjoy also! 98 or 99/100, yes I care, but knowing any number will never be enough, so it’s nearly alright with me whatever, but if he seems low in happy energy, THEN I care! Points to defend. I think there is some pressure as defending champion. Yee that’s right, but better not think too much this way – just saw a photo with Rog doing the hoola hoop or whatever you call it in England – better dancing through than worrying! Better focus on joy than struggling! Wow who’s the gorgeous guy in black?! Excellent draw analysis, thanks Jonathan. Hope Roger’s not been lacking in practice or not too tired from all sort of sponsor duties… It’s time to play tennis, baby. Wish for the best but so long as he wins Basel I’m okay with a few matches in his pocket. By the way, anyone’s seen a photo of him in Kimono? Omg. Wanda, you are so funny. Yes, let’s hope Fed’s ready to play. Happy Thanksgiving to the Canucks! Looked at objectively, I’d say his is the tougher side of the draw, but you’ve got to take what it throws up, haven’t you? Yeah seems to do have done a lot of Uniqlo, Mercedes stuff. Rolex no doubt too in Shanghai. Medvedev is the champion in Tokyo with a convincing 6-2 6-4 win over Nishikori. Tough start for Roger. I hope Jon is right and Medvedev will be tired after so many matches. We shall see, played a lot but confidence gonna be high. And he’s also playing doubles tomorrow in Shanghai. Zhang not a total mug either, wildcard, might up his game…. hasn’t got Isner and Anderson as well? I was in Tokyo today and watched Kei and Medvedev. Kei was unable to put any pressure on Medvedev’s serve. I think Fed would do better in this regard for two reasons: he can read it better than Kei did today and Fed’s serve will be better …Kei only won 29 % of his second serves while Medvedev won 81%. All in all, it was a comprehensive win by Medvedev. He had very few unforced errors, his shots were deep, his backhand was consistent, and he had excellent placement on his serve. He was regularly serving around 200 KPH. He also seemed immune from pressure. Fed will have to be careful. Nishikori’s record in finals is terrible, lost the last 8! Cool Stuart, than you for the first-person notes! What was the tournament like? Well run? Jonathan, It was very well run. Orderly, no yelling at inappropriate times, and clean. It might be almost too sterile. It was indoor this year because of repairs to the normal venue (Ariake Tennis Forest Park) for the 2020 Olympics in Tokyo. We had great seats that I was able to obtain as a foreigner … for in country, you have to get them through a lottery system. The below link provides more detail on the site for this year and how they prepared it. How is the court compared to Tokyo? I mean, this might make some difference. Well we’ll see. Interesting to see how Medvedev does in 1. round on another court. And I’m quite sure Rog will watch this match too. though his first isn’t that great either.I hope that we are not going to have a kokonakis moment here,where the Russian(fed up of spelling all these names)knocks Fed out and then disappears. And where is Millman these days? Kokkinakis and the rest? Happy when Delpo loses. Can’t help it. I saw BasilashvilIi win in Beijing. (By the way, did you know his father was a dancer in the Georgian National Ballet ?). A very good match from him but Delpo had the flu. He’ll stay a few more points away from Fed in the rankings… I also hope Fed doesn’t lose to much energy in sponsor meetings and celebrations… He should keep some time to rest too but I guess he knows how to manage it. Medvedev not only played extremely well against Kei, but against Raonic and Shapo as well. I hope he will be somewhat tired by the time he meets Fed (I think he will get through the 1R.). Because if Daniil continues to play at that level he will be tough for anyone to beat. We are building this guy up into some sort of superman which I am quite sure he is not.Nobody is red hot all the time.Different climate,surface etc.The only thing that worries me slightly is that Fed hasn’t played him before and best of three doesn’t give a lot of time to figure out a game .But if anyone can do it,Fed can. Annie, I think you are right, Medvedev is a solid potential opponent who is playing consistent tennis but he is not a future grand slam winner. Go Fed! Oh good.One less big server,now to get through the first round? Let’s hope he can take advantage! Some surprises for sure. I still wonder what the court is like? Any suggestions? I saw tweets saying it was fast, but hard to tell. I don’t see CPI ratings at all anymore on TennisTV, turned into some closely guarded secret. Hope the tweets are right. Hopefully Rog has got time now to get used to the court. At any rate Medv should be so too by now. 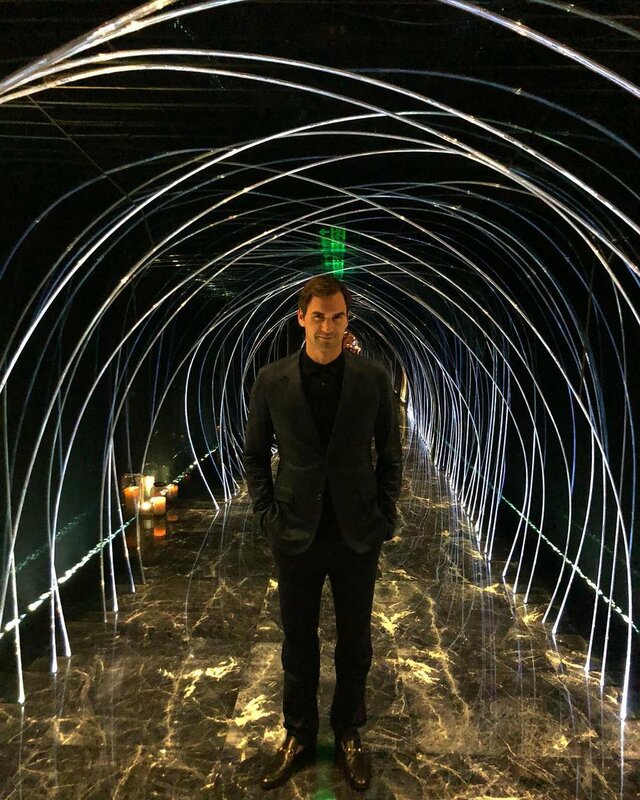 Exciting – Rog has to be alert, but that’s how he likes it, I imagine! Maybe you could change the weather forecast from Chicago to Shanghai at the bottom of the page ? About the rankings after Shanghai. “Nadal and Federer will still retain their positions even if the latter wins the Shanghai Rolex Masters. However, if Novak Djokovic wins the tournament and Federer does not reach the finals, the Serb would topple the Swiss. In the event that he wins the title, Argentina’s Juan Martin Del Potro would overtake Federer and Djokovic if the two do not reach the semi-finals”. Yes,I had forgotten the bye? Medvedev found a way to win in three sets. He should be pretty tired against Fed. Interesting factoid is that the umpire for today’s match was the same as the Tokyo Final (Rakuten) on Sunday. Yeah a lot of tennis, I see he or Basil withdrew from doubles on Monday. for Roger so lets hope he doesn’t find the serve tomorrow.? I had a feeling Zhang would give him a game, maybe could have won, tie-break looked close, dunno if he had any match points though. Usually get a Chinese player upping his game when he gets a WC on home soil. see the breaker but as soon as the Russian won it you felt he would hang on in there. C’mon Roger…give me an excuse to watch tennis all week!!! Same for me, please ? Great match between Tsipas and Kachanov.Two contrasting styles,the former almost balletic in movement,the latter hits the ball crazily hard.Some wonderful rallies and great sportsmanship throughout.Contrast with the dire behaviour of Kygios in his last match. Tsitsi looks seemingly for being the new RF, but that’s not possible. But to get near that is very good indeed! He is the guy I choose to watch whenever I have several options. Agree re Tsitsi, as for Roger Phew!